I was inspired by a photo layout in a recent Martha Stewart wedding magazine and decided to make these for my sewing/design area. The funny thing is, we had this empty cement core in the garage for some time (from an outdoor planter project that my husband tackled this past Fall), so this project allowed me to put it to good use. and then my husband sawed it into two pieces for me so that I could make two spools. Before it was cut the core was approximately 24" in length. We bought a total of four pre-made particle board discs at Lowe's. These come in several diameters; I went with 12" discs. He then routed a groove the diameter of the core so that it would sit firmly in there; then used wood glue to secure the tops and bottoms to the core. After that he drilled a large hole in both the top and bottom of the discs. I bought some very large upholstery cord at JoAnn Fabrics. I mixed up a batch of blue Rit dye and 20 yards were dyed blue; the other 8 yards I left natural. Then I just wound it around the spools; hot gluing sporadically and voila'! Perfect accents for my room. Am I the only nerd who had a plastic grocery bag attached to the dog leash to pick up after the dog? I know some folks may use a pocket, but I don't always have a pocket, so it was attached to the leash. I would then grab it and ball it up into my fist to hide it as I took my daily trek. What a freak!! Doesn't that look so much better? ..... and doesn't that leash look disgusting!.... time for a new leash! 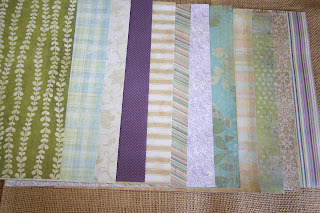 Sew the fabric right sides together using 1/2" seams; leaving an opening to turn the tote right side out. Turn right side out and stitch the opening closed using the machine. Sew the bias tape to three sides; the two lengths and along the width of the top edge; there's no need to use the tape on the the other edge since it's hidden underneath the flap. Sew the velcro pieces into place on both the underside of the top edge of the tote and the inside edge of the bottom of the tote; centering them along the width (see below). Sew around all four edges of the velcro. I placed the velcro so that the finished edge of the top of the tote will be approximately 1 1/2" above the bottom edge when it's folded into it's final shape. NOTE: Keep in mind the finished product resembles an envelope and everything will make sense. Before folding the tote into it's finished size; sew the two pieces of elastic to the outside of the back of the tote. Fold the elastic's raw edges underneath and stitch right on the edge of the elastic through both layers of elastic and the tote. My finished dimension (picture a belt loop on a pair of pants, but with elastic) is about 7/8". I wanted it nice and snug so the tote wouldn't slide down the leash as we were walking and the leash is exactly 1" wide. Lastly bring the bottom edge up and sew the right and left edges to seal the sides of the tote. Look at those eyes...she's saying "can we go for a walk now?" Now, slide the leash through the elastic guides, tuck your plastic bag inside the tote and you're all set! After the success I had with my first distressed cabinet, I offered to take a stab at an old dresser and nightstand for my daughter and her fiance'. We were donating the pieces to them anyway for their new townhome and she was hoping for a distressed look as well. These circa 1960's bedroom pieces were a part of our guest room when we lived in Seattle, but since moving back to Colorado, they were relegated to the basement. We were happy to see them put to good use again and I was grateful to have the additional room in my newly claimed sewing/design area. For this project, I really had to take the power sander to task. Circa 1960's is heavy on the stain and high gloss finish; it generally also includes laminate as was the case on the top of both of these pieces. I knew I was looking for just a bit of the dark to show through and really wanted it to have more of a "white washed" look. So, I again used an "80" as my sandpaper and really went crazy getting the base stain/finish off (without hitting the particle board). The laminate top was the worst. It is really difficult to totally remove it, so I did my best to rough it up so that the paint would adhere well. While I was tempted to totally remove the laminate, it was particle board beneath....yuck! After I sanded like crazy, I took the hammer to it. This was actually kind of fun! I banged it up pretty good creating the dents and dings to distress it appropriately. Then I used some leftover interior white paint I already had and brushed it all over the pieces. I let a bit of the original color show through. When I had finished that, I then added a touch of grey. I actually watered it down a bit so that it went on super light. I chose to finish these with a satin spray finish (thank you Dear! ), especially since they are going to get daily use. Finally, I felt the pieces needed pulls...both from a practical standpoint and for the aesthetics. I decided to use a different type for each of the four drawers on the dresser and went with just one style for the nightstand. Don't they look cute! So there you have it. With any luck these pieces will see another decade or so of use in their new home with their new owners. I purchased this bench last summer to hold our patio seat cushions, which works great over the winter months and when I remember to grab the cushions before our notorious afternoon thunderstorms come rumbling through during the summer months. Anyway, with several special events coming up soon, I thought it would be nice to take advantage of the bench for extra seating. I'm counting on good weather so the group can take advantage of our deck. This project was a breeze. Total time was <90 minutes! All I needed was foam and fabric for this cushion; I had the buttons and velcro already. The dimensions of the bench are 18 x 36, so a yard of outdoor home furnishing fabric would do the trick! You want the outdoor type since it is a more durable textile and generally has a Scotch Guard finish or something similar to help it withstand the elements. The foam is sold by the yard and it comes in different heights. I chose a simple one inch foam. I cut the fabric to take advantage of a fold and eliminate the need for an additional seam. So, the front of the cushion is on the fold and I have two side seams and one seam the length of the cushion. I sewed the fabric right sides together using 1/2 inch seams; leaving about a 10 inch opening in the long seam. After I turned the fabric right side out, I stuffed the foam through and sewed my opening on the machine. To add some finishing touches, I made a couple of decorative strips (1/4 inch finished width) for the two front corners and then sewed a button on top. I then sewed three buttons across the top of the cushion all the way through the foam to the underside. All of these buttons were in my button collection (I have two mason jars full of odd buttons). The last step was to hand sew two velcro strips to the underside of the cushions; about two inches long on each width of the cushion. I then hot glued the "mate" to the bench itself. My intent was to provide an anchor so the cushion didn't go flying away in a stiff breeze. The wedding ceremony and reception are taking place at a wonderful venue in Golden, Colorado called ThePinesatGenesee. They have two outdoor terraces for weddings; my daughter's is taking place on the Aspen Terrace. We don't intend to do a tremendous amount of decorating, we would rather let the beauty of the landscape provide the backdrop. Plus, there were some cautionary warnings which were shared regarding real flowers, since the deer and elk have been known to wander in and make a snack of them! I'm hoping to get up there to begin training the deer to wander in at just the right time in the ceremony...just kidding! !, but wouldn't that be cool? 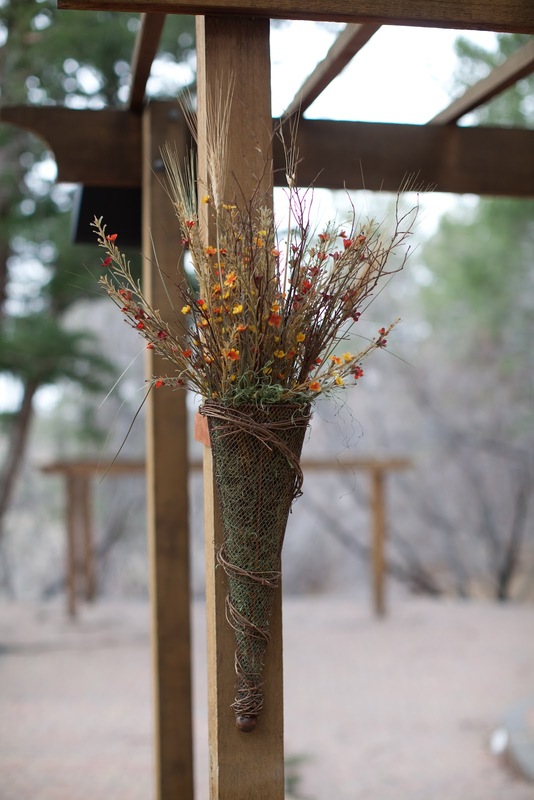 There are two wooden trellises; one you pass through on the way to the larger trellis which is further down where the actual ceremony will occur. We felt the trellises needed a little something. There are very specific policies prohibiting the use of nails, tacks, screws, etc. in other words, anything which would be semi-permanent and would damage the structures. I completely respect that given they host approximately 80-100 weddings annually. Can you imagine what the trellises would look like if every wedding hammered just one nail into the wood? Anyway, with that in mind we needed to come up with the design as well as the engineering to secure whatever it was we intended to use. We decided on two simple planters for each trellis providing just a hint of color. So, here's the finished product attached to one of the trellis posts up at The Pines. Understated and natural; yet decorative at the same time. It was really pretty simple. All the components I found at Hobby Lobby. My strategy is to either wait until something is on sale (which is fairly regularly), or I use the 40% off coupon that is in every Sunday paper. I literally am in there at least once a week! It won't be long before they start calling me by name, kind of like Norm on the old "Cheers" TV show. The velcro strap was the solution I came up with to attach it to the post without causing any damage to the structure, and as you can see from the first picture, it worked like a charm! I bought some pre-cut suede belt strapping at Hobby Lobby. I felt that would be relatively sturdy. Putting the rest together was simple...I stuffed the moss down into the base...added the wheat, flowers and branches and packed the rest of the moss around it. After the wedding, I plan to remove the straps and use the ring that is permanently affixed to the planter (for a nail) to attach them to the outside of my home. I think two of them we'll look great on the back deck! The other two will probably go to my daughter and her new hubby to enjoy at their new home. I am so happy with this project that I just have to share! I have had this cabinet for 25+ years. I always liked it, but it never held a prominent place in the house since the decor is so very different than anything else we own. So, despite my affection for it, it was relegated to an inconspicuous corner, the loft or the basement (depending on which house we're talking about). Since, I am sprucing up our basement for my sewing/design studio, which includes purging, donating and organizing all of my sewing gear I knew this cabinet could come in handy down there. Plus, I could have a little fun with color. So.....here's my "before" and "after" of this fabulous cabinet. Isn't it cool? Do you see why I chose to keep it all these years? It has so much built-in character. I had researched the topic of distressed furniture quite a bit; looked at a bunch of on-line tutorials and other blogs and finally decided to dive in. After all, what could go wrong? I completed the whole project yesterday in about six hours (that included the trip to buy the paint). I found a "baby blue" paint swatch that I liked and had a quart of paint mixed at my local Wal-Mart. I wasn't needing some type of the line paint...something simple and economical. Then, I sanded (sporadically) some of the dark color off the piece all over...nothing too drastic. That was my first attempt with a power sander...woo hoo! For the smaller areas, I sanded more carefully by hand. Throughout the piece I used an "80" piece of sandpaper, which is really rough. The idea with sanding is to allow for the blue to adhere properly and also have some of the dark continue to show through as if it were well aged. The cool thing with a project like this, is it's very forgiving. You don't have to be a fabulous painter, imperfections/mistakes can make for an even better final outcome. If you do some reading on distressing furniture, you will learn you can use screwdrivers, hammers, chains, etc., to create the dents/dings in the piece. The nice thing about this one, is it already had those elements in the wood itself. I didn't add any of that; my mission was to make the overall piece look weathered and faded. I love the nails, hinges and lattice work on this piece, they provided the interesting design elements of a previous era. I will tell you as I was working on it, I thought maybe I went too light with the blue I chose since it was looking more white as I applied the paint. But, in the end all was good. Once I stood it up and the light was reflecting on it correctly (I had it laying down on saw horses while I painted), it was perfect. Anything more blue would have been too much. After the paint was dry, I then went back at it with the sander exposing the under layer as I went. The areas which would likely be more worn is where I removed more of the top coat. For instance the drawer pulls. I love, love, love this...I think it's freakin' AWESOME (my husband said I used "awesome" way too much yesterday)...and it is going to be so perfect for this room. As you can see, I am already filling it up with all of my sewing notions and crafts which were scattered underneath my pattern table. You can probably see, I didn't worry about painting the interior. I also didn't worry about the back of the piece since I knew it was going to be to the wall. So, my one quart of paint was more than enough. I added contact paper to the shelves and drawers... a blue calico that I had on hand and went to town loading her up! Between the shelves and the drawers, I have lots of room to get myself organized. I chose not to apply a protective finish when I was done. In my opinion, any additional wear and tear is just going to add more character. Now it's your turn....it's really a fun and creative way to give new life to an old piece of furniture...just go for it!!! This project was really fun! The guest bath was in need of an update, since the sponge paint and wallpaper border from 17 years ago was screaming circa 1990's; it was high time we stepped into the 21st century. In case you are noticing a home improvement theme in my posts, you are. We've been in our house for 17 years and it's time for some changes. With a graduation in the Spring and a wedding in the Fall bringing family to town, we have some built-in deadlines to get these projects accomplished. The "honey-do" list has been never ending. I have to say, I'm pleased with the results...and you can't beat the price. The entire project set me back under $20. The first step is to head to your local home improvement store for some bathroom tiles; I chose our local Home Depot. Obviously, they have all sorts to choose from. 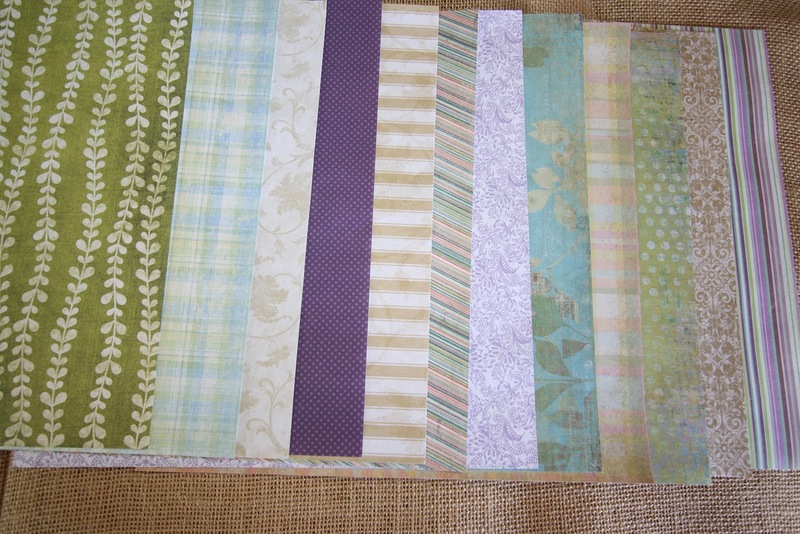 Next up, choose some scrapbook papers to create the color combinations you would like to accent the room. These 12x12 sheets are all of .59 each and I hit a 50% off sale. I selected twelve complimentary patterns for my project. Be prepared when you first apply the glue to the tile to set the paper in place, there may be creases and or bubbles that begin to form. Use your fingers to smooth those out. Once you've finished with the Mod Podge, hot glue the entire piece to a piece of foam core board. This will provide additional stability with minimal additional weight. The finishing touches included trim for the perimeter, bows and picture frame hangers. The tiles are hanging from the picture frame hangers that I super glued to the foam core backing.The bows are purely decoration versus weight bearing. I'm thinking about stenciling the walls and possibly etching the mirror (that will be a new experience for me); then a few new hand towels in complimentary accent colors and we're good to go!